While the first high school was begun in 1907 with an enrollment of sixteen students, the history of the Homer City Schools dates from 1859. 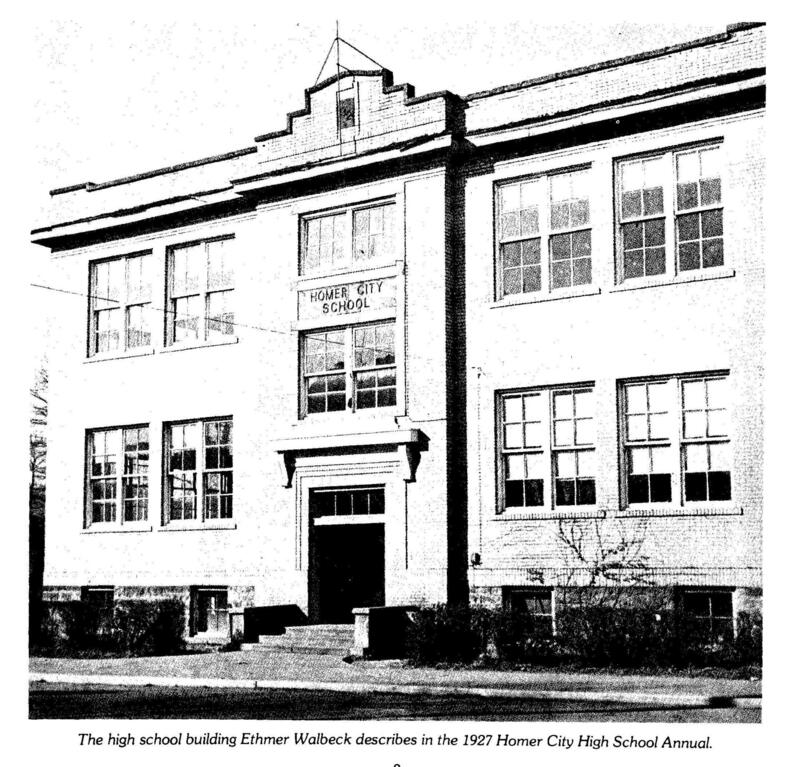 In the 1927 Homer City High School Annual, a senior Ethmer Walbeck, wrote a history of the school. It is reprinted here. 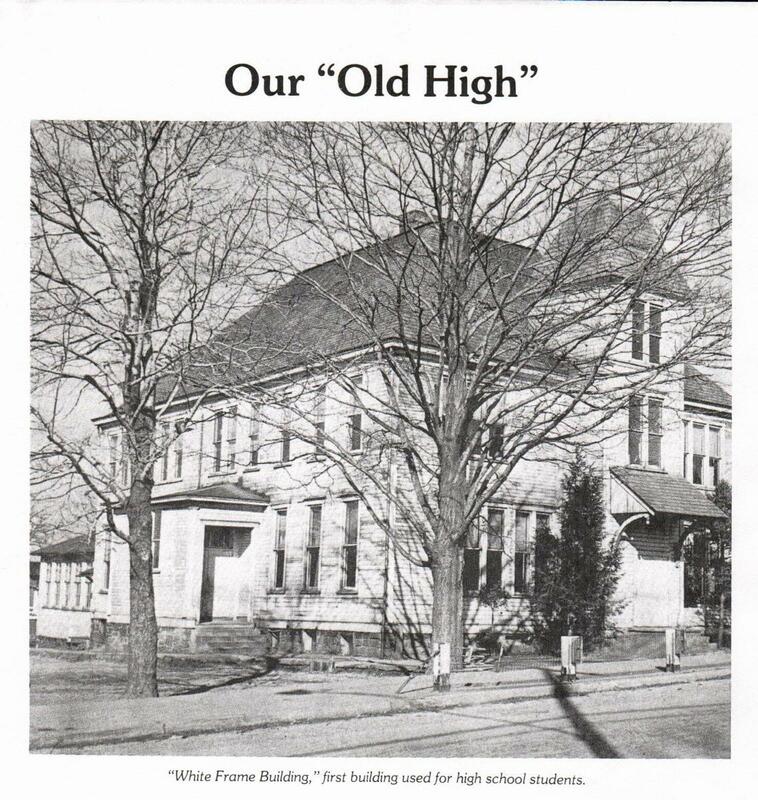 The history of the Homer City schools dates from 1859. At this time Homer City was a very small village known as Phillip's Mills. The little one-room school was located at the forks of the roads; one leading to Mechanicsburg, the other to Luciusboro. This building is still standing but has been used as a dwelling for many years. The first teacher was Thomas Chapman. His successors were Nelson Conison, Alex Coy and Simon Drenning. This was prior to the incorporation of Homer City as a borough. In 1868 a new school house was erected. This one was built below the present location of the Lutheran Church. It also is standing, having been used for some time as a printing shop. This was a two-room school, but complaints were being made of the crowded conditions. Harry W. Fee and H.H. Scott were the teachers there in the year 1891-92. The same problem confronted the board then that has confronted them time and again; the necessity of more room. The minutes of the secretary dated December 22, 1891 show that a motion was made to increase the indebtedness of the school district to an amount not exceeding forty-five hundred dollars. A committee was appointed and the lot on which our old building now stands was purchased from Mrs. Phillips. A four-room building was built, only three of the rooms being used the first year. The members comprising the board at this time were: W.I. Moore, J.L. Nix, C.W. Sutton, G.B.Stahl, John Barclay and E.E. Mikesell. The year 1893-94 saw the boys and girls of Homer occupying this new school. The next step in expansion came in 1907, when four more rooms were added, and the same year the first high school was begun with an enrollment of sixteen pupils. They occupied one room and the course was completed in two years. Mr. Simmons was the teacher of this first high school. The members of the School Board when this change was made were: W.A. Robertson, J.N. Sickenberger, J.P. St. Clair, John M. Carson, and S.L. Byers. One need only glance over the minutes of these meetings to appreciate the progress made during these years. Teachers followed one another in rapid succession until 1912. Many parents of children now in school will recall their high school days at the mention of the names of Mr. Dodson, Mr. Gaut and Miss Work. For three years Miss Work was the only high school teacher and the principal of the schools of Homer City. The year 1913 marked another step in the progress of education. Another year was added to the course of study. The enrollment had increased until it was necessary to occupy two rooms and employ another teacher. Mr. Coulter and Miss Bowes taught that year, and the next. Mr. Calhoun and Miss Grant were the teachers in the year 1914-15. Then Miss Nix and Mr. Harrison. In 1917 Mr. J.S. Byers was placed in charge of the schools with Miss Douglas as his assistant. Miss Finley filled her place in the fall of 1918. By this time the grades had outgrown their rooms, so that it was necessary to take one of the high school rooms and use it for a grade. This put the seniors into the library or bellroom. Many, who read this, will recall vividly memories of that room. In 1919 Miss Helen Martin was elected to teach in high school. She held that position three years. In the meantime a new brick building of four rooms was built. Fifth, sixth, seventh and eighth grades used it first. A third teacher, Mr. Martz, taught in high school. The next great epoch in school history was in 1922 when the fourth year was added and the following year we received from Harrisburg formal recognition as a high school of the first class. Mr. Byers was assisted now by Miss Louden, Miss Stewart, Miss Pfordt and Mrs. Nemesh. Two more rooms were added. In the fall of 1923 the high school took possession of the lower floor of the new brick building, to which four rooms had been added. The enrollment was about one hundred and thirty. Many improvements were made in the equipment. A science room, and a library containing the required books for the reading course. A music course came next with Miss Duncan in charge. At the present time our enrollment is close to the two hundred mark, and the rooms once so spacious are crowded to their limit. A glance at the figures will show that the student body has increased twelve-fold and our rooms five-fold. One room, one teacher and sixteen pupils in 1907. In 1927 five rooms, six teachers and two hundred pupils. A bond issue of fifty-five thousand dollars was approved to erect this building. The growth of the high school continued and by 1932 there was an enrollment of 320 students. The next major change in the history of the school occurred when on May 19, 1952, the school boards of Homer City and Center Township voted to form a jointure of the two school districts. The jointure became official on July 7, 1952, under the name of the Laura Lamar School District, with J.S. Byers, Supervising Principal; Leroy Smith, High School Principal; and Stephen W. Duffalo, Elementary Supervisor. The board of education formed by this jointure was composed of twelve members. Plans were immediately discussed for building a new high school to house all the students of Homer City and Center Township. Groundbreaking for the new Laura Lamar High School took place in November, 1957. This building was located along Route 119, just south of Homer City and at the former site of the Civilian Conservation Corps Camp. Completed in 1959, this two million dollar school included twenty-two classrooms, vocational and agricultural workshops, a gymnasium and an auditorium with a seating capacity of 650 persons. The school was designed to accommodate 1,078 students. Monday, September 21, 1959, was the first day that classes were held in the new building. In 1966 a state reorganization plan became effective. One of the items of this plan included a provision requiring school districts to adopt a name that would reflect the geographic location of the school district. On June 23, 1966, at a regular monthly meeting of the twelve-member Laura Lamar Joint School Board, a motion was made to change the name of the district to Homer Center School District. The newly named school district became a reality as of June 30, 1966, with Mr. Stephen W. Duffalo as supervising principal. Under the state reorganization plan, school boards were also reorganized; the number of school board members was changed from twelve to nine. In the Homer-Center School District, three board members were to be elected from each of three geographic regions within the school jointure, Homer City, Center Township I and Center Township II. A major renovation of the high school building took place during 1983-85. Over three million dollars was spent on improvements to the heating, plumbing and electrical systems, as well as the physical improvements. As part of the project, a large group instruction room was added to the building and the library was expanded. Provisions were also made for access for the handicapped.